While most grep tools only display search results on the screen, PowerGREP can save search matches into one or more new files. 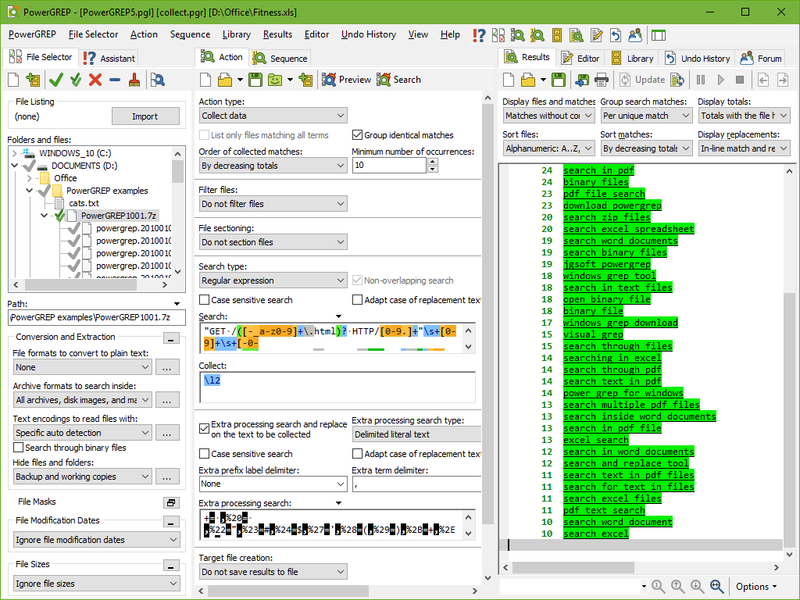 This way you can extract useful data from a large set of files, such as logs and archives. You can feed this data into another application for further processing. Use PowerGREP's unique file sectioning abilities to collect exactly those search matches you're interested in. E.g. when processing source code, you can easily skip or restrict the search to comments and strings. With the unique extra processing feature, you can convert each match into a useful format. E.g. when extracting search terms from referrer URLs in your web site's logs, you can automatically convert the URL-encoded search terms into plain text before saving them to file. You can gather useful statistics by telling PowerGREP to count identical search matches and sort them alphabetically, or by match count. You can have the statistics split up for each file that was searched through, or have everything put together to see the overall totals. You can use this to collect virtually any statistic you want from any kind of log or archive. Very handy for inspecting server or system logs for which no specialized analyzers are available, or for computing specific statistics not supported by your log analyzer. PowerGREP comes with examples for processing web server logs. These examples are explained in the documentation in great detail, so you can adapt them to your own needs or to different kinds of logs. Log files often compress really well. Web logs typically take up only 5% to 10% of their usual space when compressed with 7-zip or WinZIP. Since PowerGREP can search through compressed files directly, you can save lots of disk space while still being able to search and analyze your logs. If you are developing software that generates log files, or work with custom software that does, you can save a lot of time by creating a PowerGREP library. Share this library with customers or colleages that use the same software, instead of investing a lot of time in creating a log analyzer specific to that software. Start with creating regular expressions that match the various entries in the log files. Then use those regular expressions to create PowerGREP actions that calculate various interesting statistics or extract useful entries from your logs. Finally, put those actions into a PowerGREP library. This is a single file that you can easily email to others or make available for download. Anybody can then open that library in PowerGREP, pick an action from it, specify the location of their log files, and instantly get the specific information they want. They do not need to know anything about regular expressions or understand how PowerGREP works to do this.